Fans love free stuff when they come to the ballpark. Give-a-ways and special promotions have been a mainstay at most major and minor league venues. The Milwaukee Brewers certainly do their fair share of dishing out the goodies. Here is a list of some standout, up-and-coming promotions being offered. Saturday August 13 - Wives Mystery Bag Event. Wives of Brewers' players will be located around the Park selling “mystery bags” that will hold a signed baseball by either a coach or player. A $40 donation to the Brewers Community Foundation is the asking price for a bag. Sunday August 14 - Craig Counsell Bobble Head & German Heritage Day. Teams will wear special uniforms to celebrate Milwaukee's rich German history. All fans will receive a bobble head featuring infielder Craig Counsell in a “Bierbrauer” uniform. Saturday September 24 – Fan Appreciation Day. All fans will receive a team photo. Additional prizes will be given out throughout the evening. 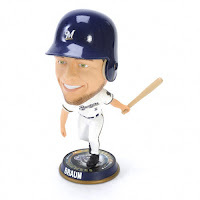 Sunday September 25 - Randy Wolf Bobble Head. Up to 20,000 Fans will receive a Wolf bobble head. 5000 random fans will find their special Wolf wearing a retro pinstripe home uniform.